After their recent pioneering experiments to couple light and matter to an extreme degree, Rice University scientists decided to look for a similar effect in matter alone. They didn't expect to find it so soon. The discovery could help advance the understanding of spintronics and quantum magnetism, Kono said. On the spintronics side, he said the work will lead to faster information processing with lower power consumption and will contribute to the development of spin-based quantum computing. The team's findings on quantum magnetism will lead to a deeper understanding of the phases of matter induced by many-body interactions at the atomic scale. "This is an emerging subject in condensed matter physics," Kono said. "There's a long history in atomic and molecular physics of looking for the phenomenon of ultrastrong cooperative coupling. In our case, we'd already found a way to make light and condensed matter interact and hybridize, but what we're reporting here is more exotic." Dicke cooperativity, named for physicist Robert Dicke, happens when incoming radiation causes a collection of atomic dipoles to couple, like gears in a motor that don't actually touch. Dicke's early work set the stage for the invention of lasers, the discovery of cosmic background radiation in the universe and the development of lock-in amplifiers used by scientists and engineers. "Dicke was an unusually productive physicist," Kono said. "He had many high-impact papers and accomplishments in almost all areas of physics. The particular Dicke phenomenon that's relevant to our work is related to superradiance, which he introduced in 1954. The idea is that if you have a collection of atoms, or spins, they can work together in light-matter interaction to make spontaneous emission coherent. This was a very strange idea. 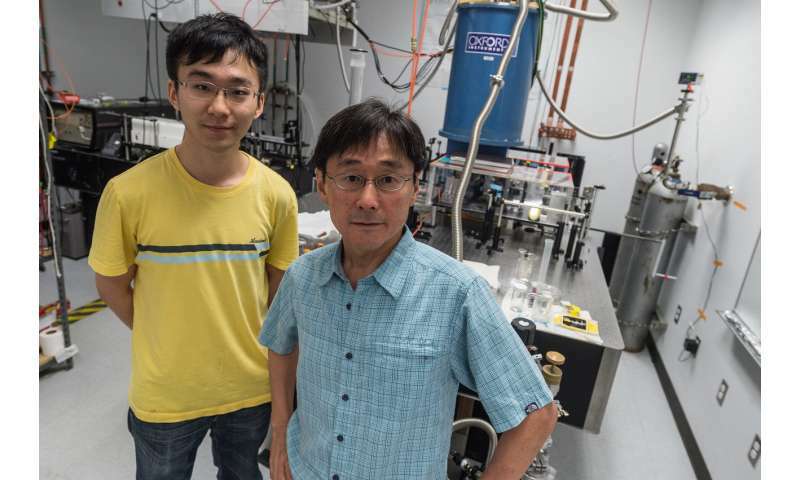 "When you stimulate many atoms within a small volume, one atom produces a photon that immediately interacts with another atom in the excited state," Kono said. "That atom produces another photon. Now you have coherent superposition of two photons. "This happens between every pair of atoms within the volume and produces macroscopic polarization that eventually leads to a burst of coherent light called superradiance," he said. Taking light out of the equation meant the Kono lab had to find another way to excite the material's dipoles, the compass-like magnetic force inherent in every atom, and prompt them to align. Because the lab is uniquely equipped for such experiments, when the test material showed up, Kono and Li were ready. "The sample was provided by my colleague (and co-author) Shixun Cao at Shanghai University," Kono said. Characterization tests with a small or no magnetic field performed by another co-author, Dmitry Turchinovich of the University of Duisburg-Essen, drew little response. "But Dmitry is a good friend, and he knows we have a special experimental setup that combines terahertz spectroscopy, low temperatures and high magnetic field," Kono said. "He was curious to know what would happen if we did the measurements." "Because we have some experience in this field, we got our initial data, identified some interesting details in it and thought there was something more we could explore in depth," Li added. "But we certainly didn't predict this," Kono said. "Within a single orthoferrite compound, on one side the iron ions can be triggered to form a spin wave at a particular frequency," Li said. 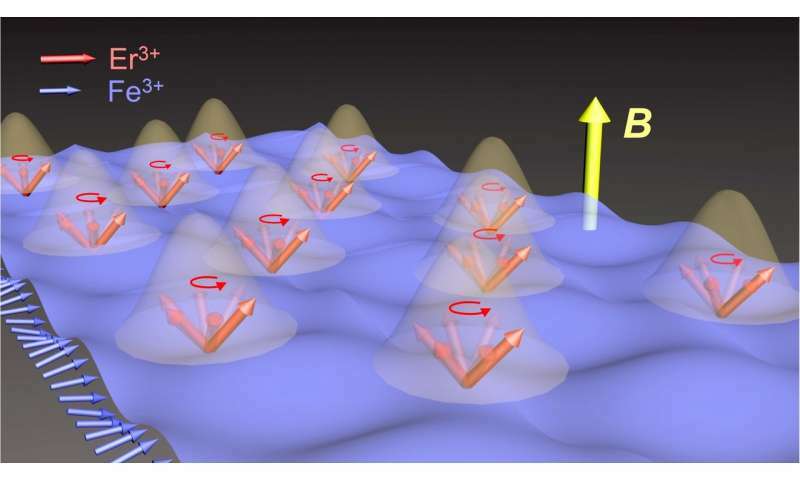 "On the other side, we used the electron paramagnetic resonance of the erbium ions, which forms a two-level quantum structure that interacts with the spin wave." While the lab's powerful magnet tuned the energy levels of the erbium ions, as detected by the terahertz spectroscope, it did not initially show strong interactions with the iron spin wave at room temperature. But the interactions started to appear at lower temperatures, seen in a spectroscopic measurement of coupling strength known as vacuum Rabi splitting. Chemically doping the erbium with yttrium brought it in line with the observation and showed Dicke cooperativity in the magnetic interactions. "The way the coupling strength increased matches in an excellent manner with Dicke's early predictions," Li said. "But here, light is out of the picture and the coupling is matter-matter in nature." "The interaction we're talking about is really atomistic," Kono said. "We show two types of spin interacting in a single material. That's a quantum mechanical interaction, rather than the classical mechanics we see in light-matter coupling. This opens new possibilities for not only understanding but also controlling and predicting novel phases of condensed matter." The matter matter coupling is based on magnetic quanta and spin due to which body functions properly. Na coupled K is well known due to spln but Ca coupling with Fe is magnetic quanta effect. If your sample is a set of centers in some sort of equilibrium; any applied magnetic field will alien any dipole's with the proper degree of freedom; any radiance is due to the circular motion of any centers. The spectra defines the motion within the field calculable and separable! Atomic polarity is the supposition of center, i.e. neg center & pos center therefore dipole. Actually a quadrapole. Spatial an Time meas difficult; so just calc a center and another, ... Don't use QM; there are too many fantasy attributes, i.e. centers are a point and don't have spin! It's a set of E Fields; Spherical E fields, Diametrical Spherical E fields, any point on a sphere with one of these at the center has the magnitude of Value@Center/Surface.area of the sphere; go figure; or the sum over the surface as the radius goes to zero is the value at the center. Since this is fundamental, any model might want to eliminate modern Constants! How many physical points over time, spectra, location can you predict?